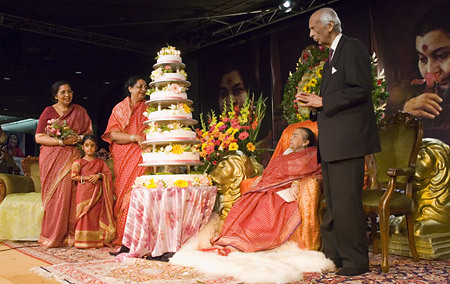 A four day celebration, beginning at the Australian National Country Property at Balmoral south of Sydney, culminated in a grand finale with Our Holy Mother and Her husband, Sir CP, Sadhana Didi and Kalpana Didi all attending the 2006 Birthday Celebration Puja at the Grand Hall in the Convention Centre at Darling Harbour in Sydney. The Grand Hall was packed with over 1,500 excited yogis in a casual, joyous state of anticipation of having their Holy Mother in Her physical presence with them. The hall with filled with flowers and a wonderful series of photographs of Shri Mother described as the ‘Rembrandt Series’ behind the stage. The hall also contained the flags of all the visiting countries to represent the world collective who were sharing the momentous occasion. Australia Council members led the way for Shri Mother and Sir CP and the Didi’s into the hall and they were soon settled on the stage. The celebrations began with every child presenting Shri Mother with large petals covered in flowers and receiving Her special attention and blessings. They were followed by Yuva Shakti’s and garlands from Australian Council members. Shri Mother allowed decoration of Her feet and looked absolutely beautiful as She enjoyed the completely unrestrained love from all of Her assembled children. Gifts from the 26 visiting countries were offered to Shri Mataji along with the International , Australian and Yuva Shakti gifts and She took great interest in them, asking questions and making comments about each one. Sir CP was offered a special gift as his birthday is the same day as Shri Mataji’s and the Didi’s also received presents. During the evening the Australian Council mentioned they had experienced great difficulty finding a gift for those who already have everything so it was decided they would present each family member with a heart which symbolically contains the heart of every yogi in the country. They also provided keys to Shri Mother’s home in Burwood, Sydney, as it is now their home and with the keys they can come any time and don’t even need an invitation. As the puja celebrations came to an end a curtain was placed around the stage and most yogis were lining the pathway expecting Shri Mataji and the family to leave when suddenly the curtain was taken away to reveal Sir CP and the Didi’s sitting next to Mother with a 7 layer birthday cake with candles representing Sahasrara. Click here for the speeeches made after the puja.